January 26 Elvis opens in Las Vegas for a two weeks engagement. February 9th Elvis closes his Hilton engagement. March 1 Tulsa, Oral Roberts University. 11,600 fans. Elvis wore his "White Way Down Jumpsuit"
March 2 Tulsa, Oral Roberts University. 11,600 fans. Elvis wore his "Sunlight Jumpsuit"
March 3th Houston, Astrodome. 43,974 fans. Elvis did 2 shows. Elvis wore his "White Nail Jumpsuit"
March 3th Houston, Astrodome. 43,974 fans. Elvis wore his "Sunlight Jumpsuit"
"Event Number Eight" (Madison) Recorded live at the Houston Astrodome, March 3th, 1974. This CD contains the following tracks; Opening Riff, See See Rider, Love Me, Trying To Get To You, All Shook Up, Love Me Tender, Johnny B.Goode, Hound Dog, Fever, Polk Salad Annie, Why Me Lord, Suspicious Minds, Band Introductions, I Can't Stop Loving You, Help Me, How Great Thou Art, Let Me Be There, Funny How Time Slips Away, Elvis Talks, Can't Help Falling In Love, Closing Riff. March 4th Louisiana, Civis Center. 8,000 fans. Elvis wore his "Sunlight Jumpsuit"
March 5th Auburn University Memorial Coliseum. 13,239 fans. Elvis wore his "Sunlight Jumpsuit"
March 6th Alabama, Garrett Coliseum. 11,328 fans. Elvis wore his "Aloha Eagle Jumpsuit"
March 7th Monroe, Civic Center. 8,000 fans. Elvis wore his "Sunlight Jumpsuit"
March 8th Monroe, Civic Center. 8,000 fans. Elvis wore his "White Target Jumpsuit"
March 9th Charlotte, Charlotte Coliseum. 11,960 fans. Elvis did 2 shows. Elvis wore his "Sunlight Jumpsuit"
March 9th Charlotte, Charlotte Coliseum. 11,960 fans. Elvis wore his "Memphis Jumpsuit"
March 10th Roanoke, Roanoke Civic Center. 10,640 fans. 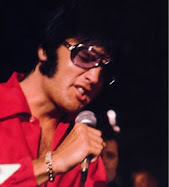 Elvis wore his "Memphis Jumpsuit"
"Live from Roanoke" Recorded live in Roanoke, March 10, 1974. This CD contains the following tracks; 2001 Theme, See See Rider, I Got A Woman/Amen, Love Me, Tryin' To Get To You, All Shook Up, Steamroller Blues, Teddy Bear/Don't Be Cruel, Love Me Tender, Johnny B.Goode, Hound Dog, Fever, Polk Salad Annie, Why Me lord, Suspicious Minds, Introductions, I Can't Stop Loving You, Help Me, An American Trilogy, Let Me Be There, Funny How Time Slips Away, Can't Help Falling In Love, Closing Vamp. March 11th Hampton Roads, Hampton Roads Coliseum. 10,957 fans. Elvis wore his "Light Blue Flower Jumpsuit"
March 12th Virginia, Richmond Coliseum. 11,791 fans. Elvis wore his "Aloha Eagle Jumpsuit"
March 13th Greensboro, the Coliseum. 16,200 fans. Elvis wore his "Sunlight Jumpsuit"
March 14th Murfreesburo, Murphy Athletic Center. 12,500 fans. Elvis wore his "Aloha Eagle Jumpsuit"
March 15th Knoxville, Stokely Athletic center, 13,305 fans. Elvis did 2 shows. Elvis wore his "White Jumpsuit"
March 15th Knoxville, Stokely Athletic center, 13,305 fans. Elvis wore his "Sunlight Jumpsuit"
March 16th Memphis, Mid-South Coliseum. 12,300 fans. Elvis did 2 shows. Elvis wore his "Sunlight Jumpsuit"
March 16th Memphis, Mid-South Coliseum. 12,300 fans. Elvis did 2 shows. Elvis wore his "Memphis Jumpsuit"
"Hello Memphis" (Rock Legends) Recorded live in Memphis, March 16, 1974. This CD contains the following tracks; Opening Theme 2001, See See Rider, I Got A Woman/Amen, Love Me, Trying To Get To You, All Shook Up, Steamroller Blues, Teddy Bear/Don't Be Cruel, Love Me Tender, Johnny B.Goode, Hound Dog, Fever, Polk Salad Annie, Why Me Lord, Suspicious Minds, Introductions, I Can't Stop Loving You, Help Me, An American Trilogy, Let Me Be There, Funny How Time Slips Away, Can't Help Falling In Love, Closing Theme. "Star Live Voice" Recorded at the Midsouth Coliseum, March 17th, 1974, Memphis Tennessee. This CD contains the following tracks; 2001 Theme, See See Rider, I Got A Woman/Amen, Love Me, Trying To Get To You, All Shook Up, Steamroller Blues, Teddy Bear/Don't Be Cruel, Love Me Tender, Johnny B.Goode/Hound Dog, Heartbreak Hotel, Fever, Polk Salad Annie, Help Me, Suspicious Minds, Band Introduction, I Can't Stop Loving You, Why Me Lord, An American Trilogy, Let Me Be There, Funny How Time Slips Away, Can't Help Falling In Love, Closing Riff. "Fire Of The King - Fever For The Fans" Recorded Live at the Mid-south Coliseum, Memphis, Tennessee, March 17th, 1974; This CD contains the following tracks; 2001 Theme, See See Rider, I Got A Woman/Amen, Love Me, Trying To Get To You, All Shook Up, Steamroller Blues, Teddy Bear/Don't Be Cruel, Love Me Tender, Johnny B.Goode/Hound Dog, Fever, Polk Salad Annie, Why Me Lord (repeat), Suspicious Minds, Band Introduction, I Can't Stop Loving You, Help Me, An American Trilogy, Let Me Be There, Funny How Time Slips Away, Can't Help Falling In Love, Closing Riff. "The Alternate Memphis" Recorded live at the Midsouth Coliseum, Memphis Tennessee, March 17, 1974. This CD contains the following tracks; 2001 Theme, CC Rider, I Got A Woman, Love Me, Trying To Get To You, All Shook Up, Steamroller Blues, Teddy Bear/Don't Be Cruel, Love Me Tender, Johnny B.Goode, Hound Dog, Heartbreak Hotel, Fever, Polk Salad Annie, Why Me Lord, Suspicious Minds, Introductions By Elvis, Can't Stop Loving You, Help Me, An American Trilogy, Let Me Be There, Funny How Time Slips Away, Can't Help Falling In Love. March 18th Richmond, Coliseum. 11,791 fans. Elvis wore his "Memphis Jumpsuit"
March 19th Murfreesburo, Murphy Athletic Center. 12,500 fans. Elvis wore his "White Jumpsuit"
March 20 Memphis, Mid-South Coliseum. The last day of the tour watched by 12,300 fans. Elvis wore his "Memphis Jumpsuit"
"Steamroller Blues" (Fort Baxter Vol.6). Recorded live at the Midsouth Coliseum, Memphis, March 20, 1974. This cd contains the following tracks; 2001 Theme, See See Rider, I Got A Woman (with reprise), Love Me, Tryin' To Get To You, All Shook Up, Steamroller Blues, Teddy Bear/Don't Be Cruel, Love Me Tender, Long Tall Sally/Whole Lotta Shakin'/Mama Don't Dance/Flip Flop & Fly/Jailhouse Rock/Hound Dog, Fever, Polk Salad Annie, Why Me Lord, How Great Thou Art, Suspicious Minds, Band Introductions, Blueberry Hill/I Can't Stop Loving You, Help Me, An American Trilogy, Let Me Be There, My Baby Left Me, Lawdy Miss Clawdy, Funny How Time Slips Away, Can't Help Falling In Love, Closing Vamp. May 10th San Bernardino, Swing Auditorium. 7,200 fans. Elvis wore his "Blue Rainbow Jumpsuit"
May 11th Los Angeles, The Forum. 18,500 fans. Elvis did 2 shows. Elvis wore his "Peacock Jumpsuit"
May 11th Los Angeles, The Forum. 18,500 fans. Elvis wore his "Aloha Eagle Jumpsuit"
May 12th Fresno, Selland Arena. 7,500 fans. Elvis wore his "Blue Rainbow Jumpsuit"
May 13th Swing Auditorium, San Bernardino. 7,200 fans. Elvis wore his "Blue Eagle Jumpsuit"
May 16th Tahoe engagement for ten days. "Spanish Eyes" (Fort Baxter Vol.10). Recorded live at the Sahara Hotel, Lake Tahoe, May 24, 1974. This CD contains the following tracks; See See Rider, I Got A Woman/Amen, Love Me, Tryin' To Get To You, All Shook Up, Love Me Tender, You Don't Have To Say You Love Me, Hound Dog, Fever, Polk Salad Annie, Why Me Lord, Suspicious Minds, Band Introductions, I Can't Stop Loving You, Help Me, Bridge Over Troubled Water, Let Me Be There, Spanish Eyes, Big Boss Man, Funny How Time Slips Away, Can't Help Falling In Love. May 26 Elvis ends his Lake Tahoe engagement. May 27 Elvis added one extra show at Lake Tahoe for the fans who have been turned away. June 15th Forth Worth, Tarrant County Convention Center. 14,000 fans. Elvis did 2 shows. Elvis wore his "Peacock Jumpsuit"
June 15th Forth Worth, Tarrant County Convention Center. 14,000 fans. Elvis did 2 shows. Elvis wore his "Blue Rainbow Jumpsuit"
June 16th Forth Worth, Tarrant County Convention Center. 14,000 fans. Elvis did 2 shows. "Inca Gold Leaf Jumpsuit"
June 16th Forth Worth, Tarrant County Convention Center. 14,000 fans. Elvis wore his "American Eagle Jumpsuit"
"Elvis The Man In White Vol.1" Recorded live in Texas, June 15, 1974, Afternoon Show. This CD contains the following tracks; C.C. Rider, I Got A Woman/Amen, Love Me, Trying To Get To You, All Shook Up, Love Me Tender/, Hound Dog, Fever, Polk Salad Annie, Why Me Lord, Suspicious Minds, Band intros, I Can't Stop Loving You, Help Me, American Trilogy, Let Me Be There, Funny How Times Slips Away, Big Boss Man, Can't Help Falling In Love, Closing Vamp. June 17th Louisiana State University. 15,000 fans. Elvis wore his "American Eagle Jumpsuit"
June 18th Louisiana State University. 15,000 fans. Elvis wore his "Blue Rainbow Jumpsuit"
June 19th Texas, Civic Center. 14,000 fans. Elvis wore his "Peacock Jumpsuit"
June 20th Des Moines, Veteran’s Memorial Auditorium. 11,000 fans. Elvis wore his "Blue Eagle Jumpsuit"
June 21 Cleveland, Ohio, Convention Center Public Hall. 10,000 Fans. Elvis wore his "Peacock Jumpsuit"
June 22 Rhode Island, Civic Center. 13,113 fans. Elvis did 2 shows. Elvis wore his "Inca Gold Leaf Jumpsuit"
June 22 Rhode Island, Civic Center. 13,113 fans. Elvis wore his "Peacock Jumpsuit"
June 23 Philadelphia, Spectrum. 19,000 fans. Elvis did 2 shows. Elvis wore his "Peacock Jumpsuit"
June 23 Philadelphia, Spectrum. 19,000 fans. Elvis wore his "American Eagle Jumpsuit"
"Conquering The Falls" Recorded live at the International Convention Center, Niagara Falls, New York, June 24, 1974. This CD contains the following tracks; Also Sprach Zarathustra, See See Rider, I Got A Woman/Amen, Love Me, Tryin' To Get To You, All Shook Up, Love Me Tender, Hound Dog, Fever, Polk Salad Annie, Why Me Lord, Suspicious Minds, Introductions, I Can't Stop Loving You, Help Me, An American Trilogy, Let Me Be There, Funny How Time Slips Away, Big Boss Man, Teddy Bear/Don't Be Cruel, Can't Help Falling In Love, Closing Vamp. "Rockin' against the roarin' falls" Recorded live at the Niagara Falls, June 24, 1974, Matinee Show). This CD contains the following tracks; See See Rider, I Got A Woman/Amen, Love Me, All Shook Up, Love Me Tender, Hound Dog, Fever, Polk Salad Annie, Why Me Lord, Suspicious Minds, Band introductions, I Can't Stop Loving You, Help Me, An American Trilogy, Let Me Be There, Funny How Time Slips Away, Big Boss Man, Teddy Bear/Don't Be Cruel, Can't Help Falling In Love. Bonus tracks; I Got A Woman/Amazing Grace (recorded live in Las Vegas, August 14, 1973, Dinner Show), Detroit City (part only), recorded live in Portland, September 11th, 1970), Charlie Pride Song (part only) recorded live in Las Vegas, August 10, 1970, Midnight Show), Charlie Pride Song (part only, recorded live In Las Vegas, September 6th, 1970, Closing Show), Hound Dog (slow version, recorded live in Las Vegas, August 30, 1971, Midnight Show), Steamroller Blues (recorded live in Las Vegas, August 7th, 1972, Midnight Show), The Most Beautiful Girl (part only, recorded live in Las Vegas, January 27, 1974), The Lord's Prayer (part only, recorded live in Las Vegas, February 9th, 1974, Dinner Show), Guadalajara (part only, recorded live in Las Vegas, August 25, 1974, Dinner Show), That's Amore (part only, recorded live in Las Vegas, March 29, 1975, Dinner Show), An American Trilogy (recorded live in Mobile, June 2nd, 1974), Young Love (part only, recorded live at Lake Tahoe, May 8, 1976, Dinner Show), Something , Return To Sender, Wooden Heart (recorded live in Ashville, July 24, 1975). June 25 Columbus, St. John’s Arena. 14,000 fans. Elvis wore his "American Eagle Jumpsuit"
June 26 Louisville, Freedom Hall. 20,000 fans see the evening show. Elvis wore his "Peacock Jumpsuit"
June 27 Indiana University. 16,000 fans. Elvis wore his "Blue Rainbow Jumpsuit"
June 28 Milwaukee, Milwaukee Arena. 11,800 fans. Elvis wore his "Blue Eagle Jumpsuit"
June 29 Kansas City, Municipal Auditorium. 10,400 fans. Elvis did 2 shows. Elvis wore his "Inca Gold Leaf Jumpsuit"
June 29 Kansas City, Municipal Auditorium. 10,400 fans. Elvis wore his "American Eagle Jumpsuit"
"Fort Baxter Profile Box vol.1 CD-2" Recorded Live In Kansas City, June 29, 1974 (Evening Show) Bonus Tracks; Stagger Lee, I Got My Mojo Working, Alla'En El "Rancho Grande" (Long Version), Cotton Fields; C.C. Rider, When My Blue Moon Turns To Gold Again/Blue Christmas, I Got A Woman, Love Me, Trying To Get To You, All Shook Up, Love Me Tender, Hound Dog, Fever, Polk Salad Annie, Why Me Lord, Suspicious Minds, Band Introductions, I Can't Stop Loving You, Help Me, Bridge Over Troubled Water, Let Me Be There, Johnny B.Goode*, Can't Help Falling In Love*. (* Recorded in Dayton, Ohio, October 6, 1974). June 30 Omaha, Civic Auditorium. 10,246 fans. Elvis did 2 shows. Elvis wore his "Blue Rainbow Jumpsuit"
June 30 Omaha, Civic Auditorium. 10,246 fans. Elvis wore his "Peacock Jumpsuit"
July 1st Omaha, Civic Auditorium. 10,400 fans. Elvis wore his "American Eagle Jumpsuit"
July 2nd Salt Lake City, Salt Palace. 13,000 fans for the final show of the tour. Elvis wore his "Inca Gold Leaf Jumpsuit"
"Kickin'Back And Forth" Rare live performances. This CD contains the following tracks; Monologue (Elvis talks about maturnuty suit filed against him), Monologue (Elvis speaks about drugs), Hawaiian Wedding Song, Caný Help Falling In Love, If You Love Me (Let Me Know), If You Love Me Let Me Know (Hilton Showroom rehearsal, August 10, 1974), Promised Land (Mother Fucker version), Promised Land (Hilton Showroom rehearsal, August 10, 1974), Aubrey (August 1974, live recording), True Love Travels On A Gravel Road, First Time Ever I Saw Your Face, Dialogue, My way, Fever, Portrait Of My Love (Hilton Showroom rehearsal, date unknown). August 19th Elvis opens in Las Vegas. "If You Talk In Your Sleep" (Fort Baxter Vol.5) Recorded Live At The Las Vegas Hilton, August 19, 1974 (Opening Night). This CD contains the following tracks; Big Boss Man, Proud Mary, Down In The Alley, Good Time Charlie's Got The Blues, Never Been To Spain, It's Midnight, If You Talk In Tour Sleep, I'm Leaving, Let Me Be There (With Reprise), Softly As I Leave You, If You love Me Let Me Know, Love Me Tender, Polk salad Annie, Band Introductions, Promised Land, Introducing Telly Savalas, My Baby left Me, Bridge Over Troubled Water, Fever, Hound Dog, Can't Help Falling In Love. CD 1: If You Love Me (Let Me Know), If You Love Me (Let Me Know), Promised Land, Promised Land, Down In The Alley, Down In The Alley, It's Midnight, It's Midnight, Your Love's Been A Long Time Coming, Good Time Charlie's Got The Blues, Softly As I Leave You, Softly As I Leave You, I'm Leavin', The First Time Ever I Saw Your Face, Proud Mary, If You Talk In Your Sleep, If You Love Me Let Me Know. "Sunlight in Vegas" Recorded live in Las Vegas, August 21, 1974, Midnight Show. This CD contains the following tracks; 2001 Theme, See See Rider/I Got A Woman/Ameen, Love Me, If You Love Me (Let Me Know), It's Midnight, Big Boss Man, Fever, Love Me Tender, All Shook Up, I'm Leavin', Softly As I Leave You, Hound Dog, You Gave Me A Mountain, Polk Salad Annie, Band introductions, If You Talk In Your Sleep, Why Me Lord, Teddy Bear/Don't Be Cruel, Hawaiian Wedding Song, The First Time Ever i Saw Your Face, Let Me Be There. "Vegas Birthday Show" Recorded Live In Las Vegas, August 23, 1974. This CD contains the following tracks; See See Rider, I Got A Woman/Amen (Story About The Black Angel), Love Me, If You Love Me Let Me Know, It's Midnight, Big Boss Man, All Shook Up, The Wonder Of You, I'm Leavin', Softly As I Leave You, Hound Dog, You Gave Me A Mountain, Polk Salad Annie, Band Introductions, If You Talk In Your Sleep, Teddy Bear/Don't Be Cruel, Hawaiian Wedding Song, Let Me Be Ther, Talk About Diamonds, Can't Help Falling In Love. "It's Midnight" Recorded live at The Las Vegas Hilton, August 24, 1974, Midnight Show. This CD contains the following tracks; See See Rider, I Got A Woman/Amen, Love Me, If You Love Me Let Me Know, It's Midnight, Big Boss Man, Fever, Love Me Tender, All Shook Up, The Wonder Of You, I'm Leavin', Softly As I Leave You, Spanish Eyes, Hound Dog, You Gave Me A Mountain, Polk Salad Annie, Introductions, If You Talk In Your Sleep, Why Me Lord, Teddy Bear/Don't Be Cruel, How Great Thou Art, Let Me Be There, Early Morning Rain, Hawaiian Wedding Song, Can't Help Falling In Love. "Night Fever In Vegas" (2 CD), Recorded live in Las Vegas, August 30, 1974, Night Show. CD 1; See See Rider, Dialogue, I Got A Woman/Amen, Dialogue, Love Me, If You Love Me Let Me Know, It's Midnight, Big Boss Man, Fever, All Shook Up, Dialogue, Softly As I Leave You, Hound Dog/Intro, Hound Dog, An American Trilogy, Dialogue, Suspicious Minds. CD 2; Karate Intro, If You Talk In Your Sleep, Karate Speech, Help Me, Let Me Be There (with reprise), Dialogue, How Great Thou Art (with reprise), Dialogue, Hawaiian Wedding Song, Dialogue, You Gave Me A Mountain, Can't Help Falling In Love. "It's Midnight In Vegas" recorded live at the Las Vegas Hilton, August 31, 1974, Midnight Show. The reacks are; 2001 Theme, See See Rider, Elvis Foolin' Around, I Got A Woman/Amen, Love Me, Elvis got a present from Lisa Marie, If You Love Me, It's Midnight, Big Boss Man, Fever, All Shook Up, Elvis talks about the missed Shows, Softly, As I Leave You, Hound Dog, An American Trilogy, Bridge Over Troubled Water, Band Introductions, Elvis Talks About Karate, Why Me Lord, Let Me Be There (repeat), Elvis talks with the audience, Hawaiian Wedding Song, Howw Great Thou Art, Can't Help Falling In Love. September 2nd Elvis closes in Las Vegas. "Fort Baxter A Profile Box Vol.1"CD-2 Recorded At College Park, Maryland, September 28, 1974 (Part 1); C.C. Rider, Dialogue, I Got A Woman/Amen, Love Me, If You Love Me Let Me Know, It's Midnight, Bigg Boss Man, Fever, Dialogue, Love Me Tender, Hound Dog, Band Introductions, Blue Christmas, All Shook Up, Teddy Bear/Don't Be Cruel, Trying To Get To You, Killing Me Softly (By Voice), When It's My Time (Stamps Quartet), Heartbreak Hotel, Let Me Be There (Withe Reprise), How Great Thou Art. Elvis wore his "Blue Rainbow Jumpsuit"
CD-3 Recorded At College Park, Maryland, September 28, 1974 (Part 2); C.C. Rider, Dialogue, I Got A Woman/Amen, Love Me, If You Love Me Let Me Know, It's Midnight, Bigg Boss Man, Fever, Dialogue, Love Me Tender, Hound Dog, Band Introductions, Blue Christmas, All Shook Up, Teddy Bear/Don't Be Cruel, Trying To Get To You, Killing Me Softly (By Voice), When It's My Time (Stamps Quartet), Heartbreak Hotel, Let Me Be There (Withe Reprise), How Great Thou Art. "Broken Finger" Fieldhouse College Park, Maryland, September 28th, 1974. This CD contains the following tracks; 2001 Theme, See See Rider, I Got A Woman/Amen/I Got A Woman, Love Me, If You Love Me, It's Midnight, Big Boss Man, Fever, Elvis talks about his broken little finger but he's lying, Love Me Tender, Hound Dog, Introductions, Blue Christmas, All Shook Up, Teddy Bear/Don't Be Cruel, Tryin' To Get To You, Killing Me Softly (by Voice), When It's My Time To Praise (the Lord by the Stamps), Heartbreak Hotel, Let Me Be There, How Great Thou art, Hawaiian Wedding Song, Blue Suede Shoes, Can't Help falling In Love, Closing Vamp. September 29 Detroit, Olympia Stadium. 17,105 fans. Elvis wore his "Chinese Dragon Jumpsuit"
September 30 South Bend, Notre Dame Convention Center. 12,301 fans. Elvis wore his "Mad Tiger Jumpsuit"
October 1st South Bend, Notre Dame Convention Center. Once again 12,301 fans. Elvis wore his "Chinese Dragon Jumpsuit"
October 2nd St.Paul, Civic Center. 17,163 fans. Elvis wore his "Peacock Jumpsuit"
October 3th St.Paul, Civic Center. Another show with 17,163 fans. Elvis wore his "Chinese Dragon Jumpsuit"
October 4th Detroit, Olympia Stadium. 17,105 fans. Elvis wore his "Chinese Dragon Jumpsuit"
October 5th Indianapolis, Expo Convention Center. 14,000 fans. Elvis did 2 shows. Elvis wore his "Mad Tiger Jumpsuit"
October 5th Indianapolis, Expo Convention Center. 14,000 fans. Elvis did 2 shows. Elvis wore his "Peacock Jumpsuit"
October 6th Arena, University of Dayton. 13,500 fans. Elvis did 2 shows. Elvis wore his "Blue Rainbow Jumpsuit"
October 6th Arena, University of Dayton. 13,500 fans. Elvis wore his "Chinese Dragon Jumpsuit"
"Breathing Out Fire" (Madison) Recorded Live At Dayton, Ohio, October 6, 1974 (Evening Show); C.C. Rider, I Got A Woman/Amen, Love Me, If You Love Me Let Me Know, Fever, Big Boss Man, Love Me Tender, Hound Dog, The Wonder Of You, Blue Suede Shoes, Band Introductions, Lawdy Miss Clawdy, Band Introductions, All Shook Up, Teddy Bea'/Don't Be Cruel, Heartbreak Hotel, Why Me Lord (With Reprise), That's All Right, Blue Christmas, Let Me Be There (With Reprise), Hawaiian Wedding Song (With Reprise), Johnny B.Goode, Can't Help Falling In Love, Closing Vamp. October 7th Kansas City, Levitt Arena. 10,000 fans. Elvis wore his "Mad Tiger Jumpsuit"
October 8th San Antonio, Convention Center. 10,500 fans. Elvis wore his "Peacock Jumpsuit"
October 9th Abilene, Expo Center. 8,604 fans. Elvis wore his "Blue Rainbow Jumpsuit"
October 11 Elvis opens in Sahara Lake Tahoe. The eight performances are makeups for the canceled shows from last spring. October 14th Elvis ends his Lake Tahoe performances. "Los Angeles California" recorded live November 5th, 1974, Afternoon Show. This CD contains the following tracks; See See Rider, I Got A Woman/Amen, Love Me, Trying To Get To You, All Shook Up, Teddy Bear/Don't Be Cruel, Love Me Tender, You Can Have Her, Steamroller Blues, Hound Dog, Fever, Why Me Lord, Suspicious Minds, I Can't Stop Loving You, Help Me, American Trilogy, Let Me Be There, Funny How Time Slips Away, Big Boss Man, Can't Help Falling In Love. The King is Back on the Charts!